Quickly navigate and edit software on a function-by-function basis. Watch Code Connect walk-through video. This is a preview release that works in all editions of Visual Studio2015; we appreciate your feedback and suggestions and would love to hear from you! 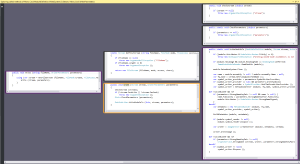 Code Connect is a plugin for Visual Studio that helps you understand complex code. Instead of working with code organized on a file-by-file basis, navigate code one function at a time in the order the computer will execute them. This approach allows you to quickly understand software projects and better reason about them. See how Code Connect helps refactoring. Visualize relationships within code, whether you're refactoring old, or exploring new code. Reduce the mental overhead associated with large projects allowing you to focus on the creative elements of software design. Navigate up and down the call stack during development with Code Connect's innovative UI. Individually explore and understand new code. Spend less time onboarding new hires.